Clutching his Dad's hand, Jamie walked into the classroom. It was his very first day at Inkwell School, and the teacher was waiting. "Good morning, everyone," said the teacher with a smile. 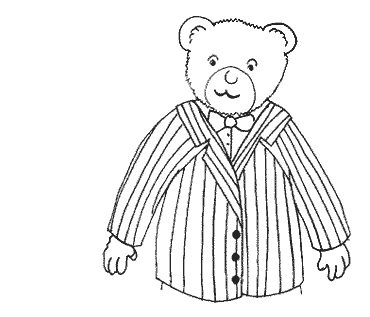 "My name is Mr Podge." Jamie's mouth fell open. He tugged Dad's sleeve and whispered, "But, Dad, he's..."
"Ssh!" said Dad. "Don't point. It's rude." "But, Dad, the teacher! He's a..."
"Ssh!" said Dad again. "I know he looks a bit strange, but I expect he's very nice." "Everybody sit down, please," said Mr Podge. So all the children sat cross-legged on the carpet. Their Mums and Dads said goodbye to them and went away. Jamie had been expecting some of the children to cry on their first day at school. But nobody cried. They all sat open-mouthed and stared at Mr Podge. Mr Podge was telling them where they could find things in the classroom. But the children were too busy staring to listen properly. Mr Podge had a furry sort of voice. He also had a furry sort of face. He had round cheeks, round ears, and fat fingers, all covered in soft golden fur. He wore a suit that was striped red and white like a candy bar. "I'd like everybody to sit around the tables now," said Mr Podge. They all sat round the tables, as good as gold, still staring at him. "We're going to draw some pictures of our families," said Mr Podge, handing out sheets of paper. The children began to draw. At first they drew silently. Then they began to whisper to each other. Jamie was sitting next to Frank and Molly. He knew them from nursery. They had all visited the school together a few weeks ago. "He's a teddy-bear!" hissed Frank. "He can't be," Molly said. "Teachers can't be teddy-bears." "But he looks just like a teddy-bear," said Jamie. Then they all closed their mouths as Mr Podge walked over to their table. "Nice drawing," he told Jamie in his furry voice. Close up, he looked even more like a teddy bear. He picked up a pencil in his furry hand. No, not a hand, thought Jamie: it was a paw. "I'll draw my family too," said Mr Podge. On a clean sheet of paper, he drew three people. They looked rather strange. "They look a bit like-" began Jamie. "Like what?" asked Mr Podge. "Nothing," said Jamie. The truth was, they looked furry too. But they did not look like teddy-bears. They looked more like real bears - fierce and scary. So he was afraid to ask. After drawing, the class did some reading, counted blocks, and practised writing letters. They also did some snoozing, counted buns, and practised making porridge. Mr Podge seemed to think that all these things were very important: especially the porridge. He wheeled a stove out of his cupboard and gave each child a little pot to mix the oats in. "Make sure your porridge is not too hot and not too cold," he warned them. "It needs to be just right." At the end of the day, full of porridge, Jamie ran out to meet his Dad. "How did it go?" asked Dad. "Fine," said Jamie. "Mr Podge is really nice. But, Dad, he looks just like a teddy-bear!" "He does rather, doesn't he?" said Dad. "But of course teddy-bears can't be teachers." "He's just rather furry, that's all," said Dad. "It's good manners not to say anything about it." So Jamie didn't say anything about it. Neither did anybody else. None the less, the children were convinced that their teacher was a teddy-bear. Not that they minded. Mr Podge was very kind. He never shouted or made a fuss. Some of the other teachers looked a bit scary, especially the headmaster, Mr Gonightly. Mr Gonightly always wore a long black cloak and a frown. He had a bald head and strangely pointed teeth, and swept along the corridors looking for people to tell off. Mr Gonightly didn't like Mr Podge. Sometimes he would whisk into the classroom and glare at him. "Equal rights rubbish!" he would mutter. Jamie wasn't sure what he meant. But since all the children were as busy as bees and as good as gold, there was nothing for him to complain about, and he soon whisked out again. Jamie was glad they didn't see much of Mr Gonightly. Life in Mr Podge's class was very comfortable. There was porridge every afternoon - sometimes with honey on it. And on Fridays they all had a picnic on a big blue blanket. It was fun. He was making lots of friends and learning lots of things. However, one of the things that he was learning was that Inkwell School was rather strange. For a start, there was the well in the middle of the playground. The school was named after it, although it wasn't full of ink. Nobody knew what it was full of. It was too deep and dark for anyone to find out. And then there were the things that happened in the school. One day when Jamie looked out of the window, he could have sworn he saw a dragon chasing Year One round the playground. Another time, a giant turned up in the dining room, demanding dinner. But when he told Dad about these things, Dad laughed. "What an imagination you've got, Jamie! Still, I'm glad you're enjoying school." And Jamie was... Until one day, when he was busy making his afternoon porridge. He glanced out of the window and froze in fear. Molly and Frank turned round and looked. And they froze too. "It might just be a big dog," said Molly doubtfully. "I don't think so," murmured Frank. It was certainly very big indeed. It was dark gray and shaggy. It was snuffling around the playground with its long nose to the ground. Then it looked up and stared at them through the window. There could be no doubt: it was a wolf. A very big wolf. And judging from its mean and greedy look, it was a very bad wolf as well. Mr Podge had seen it too. "Well, well," he said in his comfortable voice. "Everybody keep calm. There's nothing to worry about." He strode over to the window and slammed it shut. Then he closed the classroom door and pulled a table in front of it. The wolf came right up to the window and looked in. All the children stared back. But nobody panicked or screamed. And after a minute the wolf gave up and loped away. Then they heard the door into the playground open with a squeak. They heard footsteps pit-pat down the corridor. They heard something scratching at the classroom door. The table in front of the door shifted a little. Mr Podge sat on it and it stopped moving. The footsteps pit-patted away. They heard the wolf run down the corridor past the other classrooms. "But where's it gone?" burst out Molly. "My sister's in Year Three!" "Don't worry," answered Mr Podge. "All the teachers here are very sensible. They'll know what to do." He paused. "Well, nearly all the teachers..."
Just then, a dreadful scream rang down the corridor. "Oh, dear," said Mr Podge. "That sounds like Mr Gonightly. He can't have closed his door." "What can we do?" cried Jamie. Even though he didn't much like Mr Gonightly, he didn't want the headmaster to be gobbled up by a wolf. "Let me see," said Mr Podge. He scratched his furry head. "Who can make noises like a pig?" Immediately all the class began snorting and grunting. "Jamie, Molly, Frank: you three are the best pigs. Come with me. Everybody else - keep making your porridge." Grabbing the blue picnic blanket, Mr Podge led the three children down the corridor to the headmaster's room. The children hid behind him as they peered around the door. There was no sign of Mr Gonightly, but the wolf was growling and snapping at the cupboard. Mr Podge did not go in. Instead, he led the children round the corner into the school library. There he told them to hide behind the bookcases and make their best pig noises. At once Jamie began snorting and grunting. The other two copied him. And before very long they heard a pitter-pat of big, bad paws. The wolf slunk round the corner. "I hear three little pigs," it growled, its eyes gleaming. "Three plump little piggies." It ran a red tongue around its sharp yellow teeth. The children crouched in their hiding-place. Even though his heart was going thud thud thud, Jamie kept on grunting. "Oh, little piggies!" cried the wolf. "Your Granny's come to see you. Come out, come out, wherever you are, and meet your nice old granny!" The children did not come out. But Mr Podge did. He jumped up from behind the bookshelf, threw the picnic blanket over the wolf and wrapped it up tight. Then he sat on it. Underneath Mr Podge, the wolf began to yowl and howl. "Be quiet," said Mr Podge. "I'm not letting you go until you promise not to eat anybody." "I don't promise," yowled the wolf. "I'm hungry!" "NO! You'll have to let me up some time," snarled the wolf, "and then I'll eat whoever I like!" "Hmm," said Mr Podge. Jamie was worried. Mr Podge couldn't stay sitting on the wolf for ever. He would have to get up some time. "Jamie," said Mr Podge in his furry voice, "and Frank and Molly, run back to the classroom and tell everybody to come here with their porridge pots." The three children ran to the classroom. They panted out the message to the class. Twenty-three children ran back, all clutching pots full of freshly made porridge. "I hope your porridge is not too hot?" said Mr Podge. "And not too cold?" "It's just right!" Jamie's class assured him. "Good." Mr Podge unwrapped the blanket from the wolf's head. At once it began to gnash and clash its slavering jaws. As it opened its mouth for a gnash, Mr Podge poured a pot full of porridge in. The wolf had to stop gnashing to gulp and swallow. As soon as it opened its mouth for another gnash, Mr Podge poured in another pot full of porridge. The wolf gulped it down. "More!" it said. It liked the porridge. It slurped down more and more. At last, when twenty three potfulls of porridge had gone into the wolf, Mr Podge stood up. "You can't possibly feel hungry now," he told the wolf. The wolf got to its feet and burped. Then it staggered and fell over on the blanket. It was covered with splatters of porridge. "I feel very full," it said drowsily, before its eyes closed and it began to snore. "Well done," said Mr Podge to everybody. "That was first-class porridge." Jamie stared at the wolf asleep on the library floor. "What are we going to do with it?" he asked. "Cut off its head," suggested Molly. "Dear me, no!" said Mr Podge. "How very messy that would be." "Drop it down the well," suggested Frank. "Dear me, no!" said Mr Podge. "The tortoise wouldn't like it." "What tortoise?" Jamie asked. But Mr Podge was busy trying to pull the blanket out of the library, with the wolf on top of it. "Give me a hand," he said. With the children's help, he dragged the sleeping wolf through the door and out into the playground. "Let's go back into the classroom now," he told the children. But Jamie stared at the wolf, snoring loudly on top of the blanket. "We can't just leave it in the playground!" he protested. "What will happen when it wakes up?" "Ah," said Mr Podge. "Good question. Jamie, you can write quite well, can't you?" "I want you to write a sign in very big, black letters. I'll show you what to write." "That should do the trick," said Mr Podge. Puzzled, Jamie watched as Mr Podge propped the sign up next to the wolf. Next Mr Podge did a strange thing. He put his furry paws into his mouth and whistled very loudly. Then he ushered everybody back into the classroom. "Time for a snooze after all that excitement," he said. So all the class put their heads down on the tables for a snooze. Soon everyone was gently snoring, just like the wolf. Everyone except Jamie. He looked at Mr Podge snoozing in his chair. He looked at all the dozing children. Then he noticed someone at the far end of the playground, climbing over the fence. Not just someone - there were three of them: one big, one not so big and one quite small. Jamie rubbed his eyes. Maybe he really was asleep and dreaming, because they looked remarkably like bears. Not teddy bears: real bears. They lolloped across the playground on all fours. He watched them stop next to the sleeping wolf. They stood up on their hind legs and frowned at the sign. "Beware of the porridge-eating wolf?" said the biggest bear. "Look! It's covered in porridge!" said the middle one indignantly. "So it's the wolf who's been stealing it from our bowls, and eating it all up!" squeaked the smallest bear. "I bet it's the wolf who's been sleeping in our beds as well," declared the middle bear. "I bet it was the wolf who broke my chair!" complained the smallest. "We can't let it get away with that!" growled the biggest bear. Opening its mouth wide, it roared a terrible roar. The wolf woke up with a start, and saw the three bears roaring and growling at it furiously. It jumped up in alarm and tried to run away. But it was so full of porridge that it could hardly move. It waddled across the playground with the three bears lumbering after it. "We'll teach you to eat our porridge!" roared the bears as they chased the whimpering wolf. Jamie watched it stumble over the fence and stagger away into the distance, with the bears right behind it. He watched until he could not see them any longer. Then he turned round. Mr Podge yawned and stretched. "Home time, everyone," he said. "We've had a very busy day. Well done for being so calm and helpful." "Mr Podge! The wolf has gone!" cried Jamie. "I thought it might," said Mr Podge in his comfortable way. "Go and fetch your coat now, Jamie." So Jamie fetched his coat, and was about to run outside to Dad when a thought struck him. "Mr Podge! What about Mr Gonightly? Do you think he's still hiding in his cupboard?" "Oh, I expect so," said Mr Podge. "Don't worry. I'll let him out, some time. Bye bye, Jamie." "Bye bye!" said Jamie, and he hurried out to Dad. "Good day at school?" asked Dad. "Oh, yes!" said Jamie. "It was brilliant." Jamie opened his mouth to tell Dad all about the porridge-eating wolf and the three bears. Then he slowly closed it again. "I wrote a very useful sign," he said at last. "And I helped Mr Podge a lot." "Good boy," said Dad. "Mr Podge is nice, isn't he?" "He's great!" agreed Jamie. "Even if he is a te- a teacher with a very furry face."